Hi all, and welcome to the June Cross Canada Blog Hop where our theme is Summer Vacation! As you are hopping through our projects, please leave comments! We love to get your feedback on our artwork, whether it is to compliment, complain, or ask questions about a technique you see or something you would like more information about. If you got here from Donna's blog, you are on the right track, but if you get lost along the way, just head back to Michelle's blog where you will find the entire list of hoppers. Summer is my FAVOURITE season! I love the warmth of the sun after so many cold winter days, and the colours of the trees and flowers after all those months of white, grey and brown. Since my summer vacation will be partly in Walt Disney World for the Close to my Heart Annual Convention, and partly at home, I have created two layouts. The first is photos of my backyard - my happy place. I love sitting outside and watching the bees in the flowers. 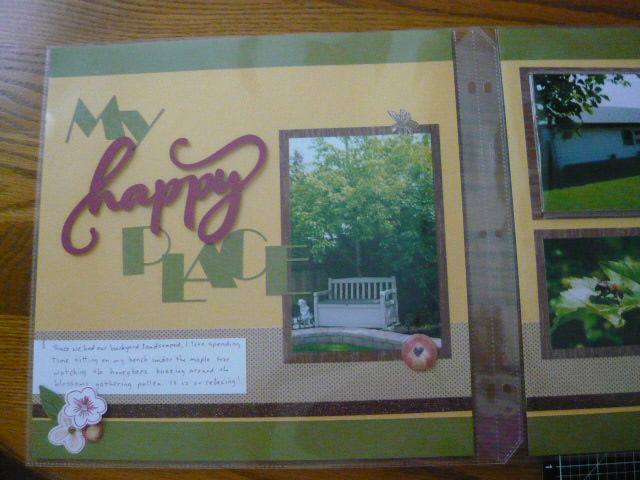 I used Canary and Topiary cardstock for the base pages and some Pomegrante for the "happy". The words were cut with my Cricut (sorry, Can't remember the font) and I used our Springtime Wishes Thin Cuts and stamps for the flowers. I added the Bronze Shimmer Trim because it really needed a little bling. 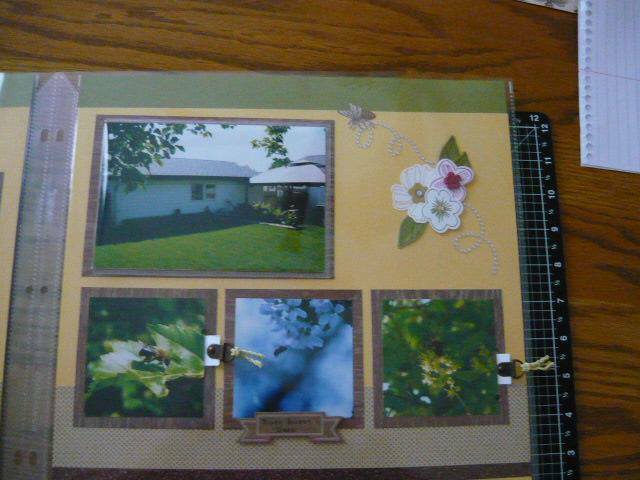 On this page, I used a flip flap for the 4X6 picture and added my journalling under it. There are also pull outs under the two outer 3X3 photos with little saying I found about bees. 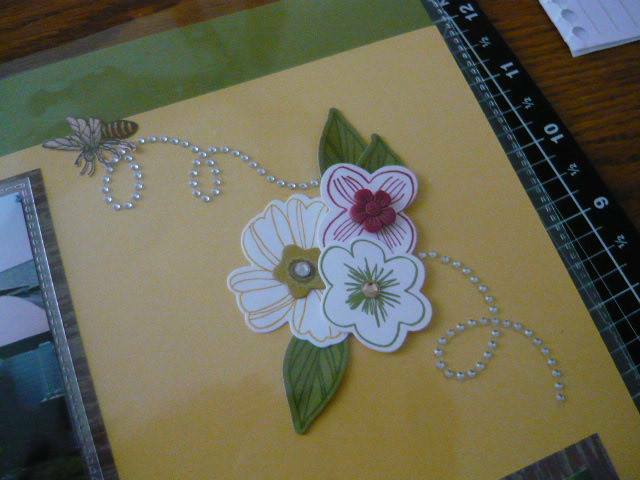 This last picture shows the flower cluster I made using the Springtime Wishes Thin Cuts and stamp set. I had a Sparkle Flourishes strip in my stash so cut it up to mimic the flight of a bumble bee, then cut the bee from the only piece of Buzz and Bumble paper I had (it was a tiny piece that had one complete bee on it!). The second layout I made for my WDW and convention photos. This is also my roomie gift for my three wonderful roommates. Hope you liked them, ladies! The words and Mickey are all cut using my Cricut Explore Air, and the stamp I used was the one we received at Convention 2011, D1500 Dream. The polka dot paper (5/8" X 11") is from La Vie en Rose and the base is Black, Cranberry (11.5" X 11.5") and White Daisy (11" X 11"). At convention, we are inspired to create and the follow our dreams. Isn't that what our founder, Jeanette Lynton, did when she started D.O.T.S.? And aren't we ever so glad she did!? Thank you, Jeanette! I love this quote from Walt Disney. "All our dreams can come true if we have the courage to pursue them". Sometimes I think Jeanette and Walt shared a brain! That's it for this month! Next on the hop list is Corinna so head on over for some more great artwork! If I have inspired you to create and you would like more information about Close to my Heart, please leave me a comment and I will get back to you as soon as possible. And remember that July is the PERFECT month to join the Close to my Heart family, because you not only get your beautiful New Consultant Kit for a measly $95, but you will also have your choice of a NEW Fundamentals paper pack and all of the co-ordinating Complements! This is in addition to the $60 you receive in Select Product Credit with your New Consultant Kit, so you can go shopping for even more great product! Interested? Contact your local Close to my Heart consultant for more information. To find a consultant near you, click here.